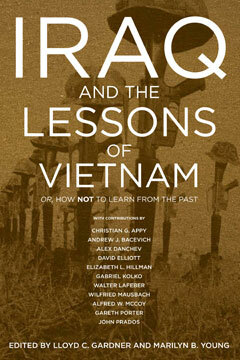 Iraq and the Lessons of Vietnam brings together the country’s leading historians of the Vietnam experience. Examining the profound changes that have occurred in the country and the military since the Vietnam War, celebrated historians Marilyn B. Young and Lloyd Gardner have assembled a distinguished group to consider how America has again found itself in the midst of a war in which there is no chance of a speedy victory or a sweeping regime change. Iraq and the Lessons of Vietnam explores how the “Vietnam Syndrome” fits into the contemporary debate about the purpose and exercise of American power in the world. With contributions from some of the most renowned analysts of American history and foreign policy, this is an essential recovery of the forgotten and misbegotten lessons of Vietnam.